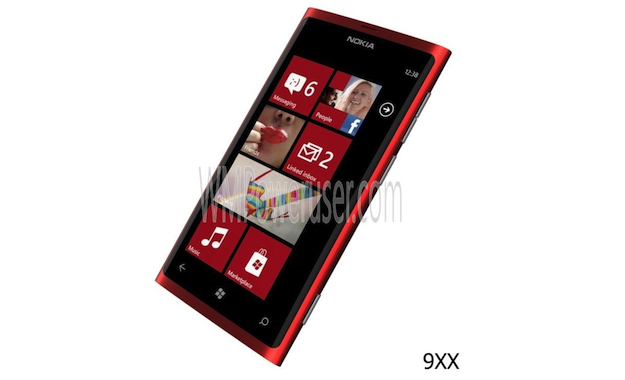 Nokia Lumia 900 render leaks, is it the real thing? The ongoing saga of the Nokia Lumia 900 took an interesting turn today, as WMPoweruser.com has published a render of said phone. Delivered to their inbox anonymously, the device bears a striking resemblance to the Lumia 800, but with a few subtle differences. Most noticeable of all are the lower set and wider apart capacitive buttons below the screen, a feature which suggests the device pictured has a larger screen than the Lumia 800. To us, the chassis doesn’t look exactly like the 800’s polycarbonate shell either, but more like the Nokia N8’s anodized metal body — now wouldn’t that be something special. Rumors of a true top-of-the-range Nokia Windows Phone handset have been circulating since the announcement of the 710 and 800 back in October. The general consensus is that the phone will have a 4.3-inch AMOLED touchscreen, a 1.4Ghz processor and an 8-megapixel camera. Other, perhaps less likely, inclusions being suggested are NFC support, 4G LTE and the next incarnation of Windows Phone 7, codenamed Tango. The rendered image joins a tweet sent by the Swiss carrier Swisscom earlier in the week, as mounting evidence that the 900 is real and headed our way soon. Responding to a question regarding the release date for the Lumia 800, Lumia 900 and HTC Titan, the Swisscom representative let slip the unannounced Lumia 900 would be out in February. An end of February 2012 release would make the Lumia 900 the ideal flagship device for Nokia to unveil during Mobile World Congress, which takes place from February 27 to March 1. It would be tight, but Nokia did surprise with the swift turnaround for the Lumia 800 following Nokia World.